"The renewal of the church will come from a new type of monasticism which only has in common with the old an uncompromising allegiance to the Sermon on the Mount. It is high time men and women banded together to do this." Monasticism is one of the oldest human institutions. It testifies to the unquenchable thirst of the human soul to awaken to its origin. The first Christian monks appeared early in the Church's history as an attempt to recover the primary experience of faith. They began as hermits in the Near East, flowered in the Egyptian desert in the fourth century AD, and then spread to Europe. The Desert Tradition was brought to the west by John Cassian and it strongly influenced both Celtic and Benedictine forms of monasticism. Early Christian monasticism had a strongly lay character and developed in contrast to the clerical state. Monks were free spirits seeking God through Christ, alone or in community. By the 6th century Saint Benedict, who was not a priest, inherited a diverse set of Christian monastic forms. In his famous Rule for Monasteries he simplified and synthesized this tradition and produced a vision of life that has inspired Christians of all walks of life down to the present day. 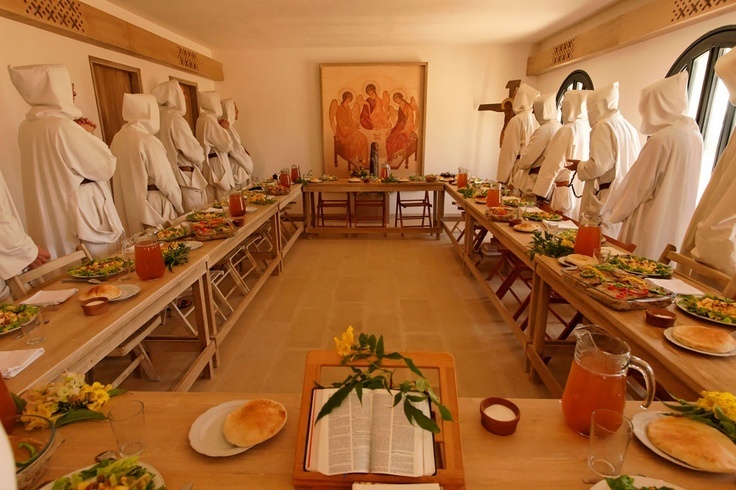 There are many different forms of monastic life and community. Today’s "Monastic" may live singly, in marriage, or in one of several forms of shared life with others. All these ways of life are livable in the Monastic Community. We recognize today both the need for a pluralism of forms and for a spirit of adventurous experimentation as this ancient tradition evolves. The Modern Monastic Order of the Most Holy Mary Theotokos is an expression of our commitment to the relentless pursuit of this ancient Christian spirituality in the modern world. We enjoy sharing our faith and talking about our Christian Journey. We try to be honest and open about what we experience and learn along the way. It is our hope that in doing so, we may inspire others to walk beyond the world of “pop-culture” faith and seek something more sincere and holistic. God does not call all of us to leave our homes and families and live in a monastery on a secluded mountain top. But, he does call us to lead lives devoted to love, compassion, and prayer. O.SS.T. is an expression of our pursuit of faith. We indeed have been spiritually compelled by our Lord and the Gospel to lead an active, cosmopolitan, and universal faith; serving Jesus Christ and sharing our faith with one another beyond the narrow confines of our own religious community. In spite of the geographical miles that physically separate us, we share a regular, daily discipline of worship throughout the day every day. And we practice that faith with those outside of our usual religious circles. We are called to live in honesty, modesty, and simplicity. Practicing meditation every day does not mean one has to become a monk. Why then do some meditators do so? Because they feel the value of expressing in a visible, human way the sense of community they feel with others seeking God on this path. Because we all need support, encouragement, inspiration and the challenge of others to deepen our commitment. Because the sense of tradition needs to be made real in a living community and the Marian tradition is deep and wide enough to give hospitality to a very broad spectrum of people. Also because they see that modern life can lack meaning, spiritual focus, and balance. In the Marian vision they see the elements of a healthy style of life: a balance and harmony of body, mind, and spirit. A context for the study of scripture and spiritual thought which the way of meditation naturally encourages and makes a source of delight. Meditation is about the journey to the Center - one's own Center and the Center, which is God. Christian Meditation is the spiritual journey into this center by becoming centered in the heart and mind of Christ by a way of silence, simplicity, and stillness.